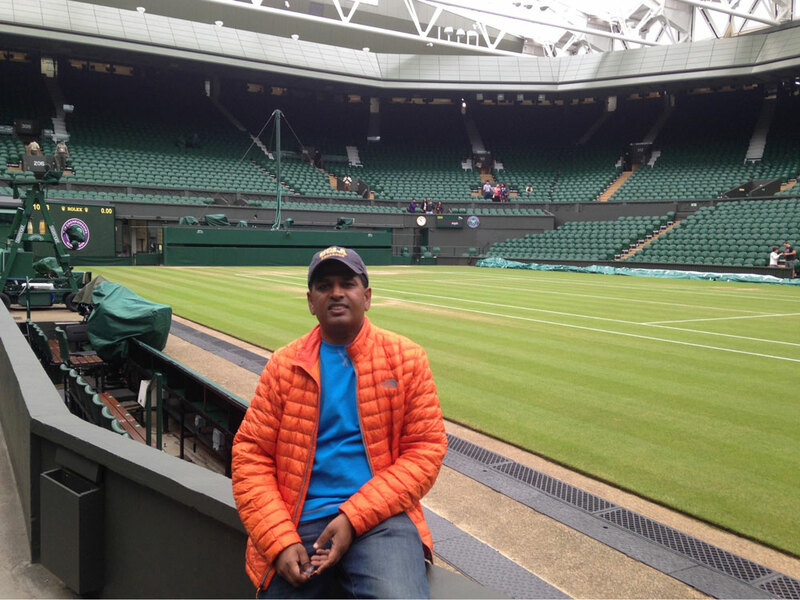 Reading Navin’s account of The Queue at Wimbledon brought back a fond memory from 2015. A long time tennis fan and player, I always wanted to watch a match on Centre Court, the tennis mecca. That year I happened to be in London in early July with my wife and three young kids and briefly inquired into buying tickets. Between family plans and the exorbitant resale ticket prices, I decided it was not going to happen. However one evening I heard about The Queue and decided to go for it. I took an Uber to Wimbledon that very night at 10:30 pm, carrying only a change of t-shirt, socks and underwear in my jacket pocket. There was a 50% chance of rain showers that evening, but there wasn’t any time to find a tent or sleeping bag or even a ground sheet. I arrived at Wimbledon just before midnight and was dropped at the main gate. It was deserted; apparently it does not start at the main gate and is a distance away in a field. Thirty minutes later I found The Queue and was asked if I wanted to watch the women’s singles quarterfinals the next day or men’s singles quarterfinals the following day. Women’s singles it was and I was given a queue number. I was shocked at how many people were in line two days early for the men’s singles; it turned out to be driven by them wanting to see Andy Murray. I made my way to my area right after the last tent. In the distance a bank portable restrooms had been set up. Most people were asleep but I chatted with some women in a nearby tent, who were also there for the first time, and we downed a bottle of wine. Unfortunately I was not invited to stay in their two person tent; so had to go outside. I went to sleep around 2 am, lying on the damp grass and using my shoes as a pillow. About 30 minutes later, I was awakened by a strange sensation in my right foot; a tugging of some kind as if someone was trying to roughly pull off my sock. I woke up and there was a fox nibbling at my foot! I was startled and jumped up, yelled, and the fox ran off. A little shaken, it took me another 30 mins to fall asleep. Around 3:30 am, another tugging feeling, this time on my left foot! Yes, the fox had returned and somehow wanted to make a meal out of my foot. This time I had enough and decided I needed to seek help; I did not want to take any risks with a possibly rabid fox! 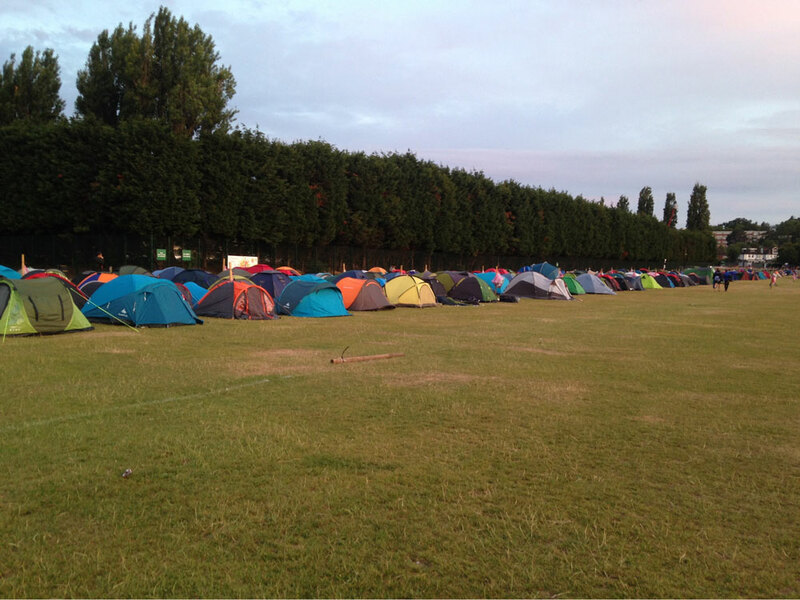 The overnight Queue attendants laughed at my story and told me the foxes were quite harmless and to ignore them. Easier said than done. By the time I got back to my patch, dawn was beginning to break and any thoughts of sleep were over. Thankfully it did not rain that night. In the morning everyone got up and there was some great camaraderie. There was food for sale from some temporary stalls. Everything was extremely orderly; The Queue system has been perfected over the years and they have very strict rules including measures to prevent queue tickets from being resold. However it did require several hours of waiting in various lines and holding areas as you make your way to the grounds. There is even a place where one can leave their camping gear for pick up later in the day. Finally we got to the ticket line on the grounds and I requested one ticket to Centre Court. They had three price points, I went with the best which was very reasonably priced around $80. As I was ushered to my seat the view kept getting better and better; I ended up in the third row near the Royal Box right where the players walk in!! It was an amazing experience and I got to see Serena Williams, Maria Sharapova, and several other top women up close and personal. My family and friends saw me on TV – my bright orange jacket helped – and it is something I would definitely do again. I spent most of the time at Centre Court but did walk around and watch some tennis at the outlying courts. Do it if in England during Wimbledon. Pick a day when an Englishman, or Englishwoman, is not playing. Take a sleeping bag or tent if its cold or rainy. Else pack some fox repellent. Uber or taxi over there to save time parking. To get the best seat, go by yourself. Take some reading materials since there is a lot of dead time. The famous strawberries and cream are totally overrated and not sweet. If you are South Asian, or just have a sweet tooth, add some sugar. 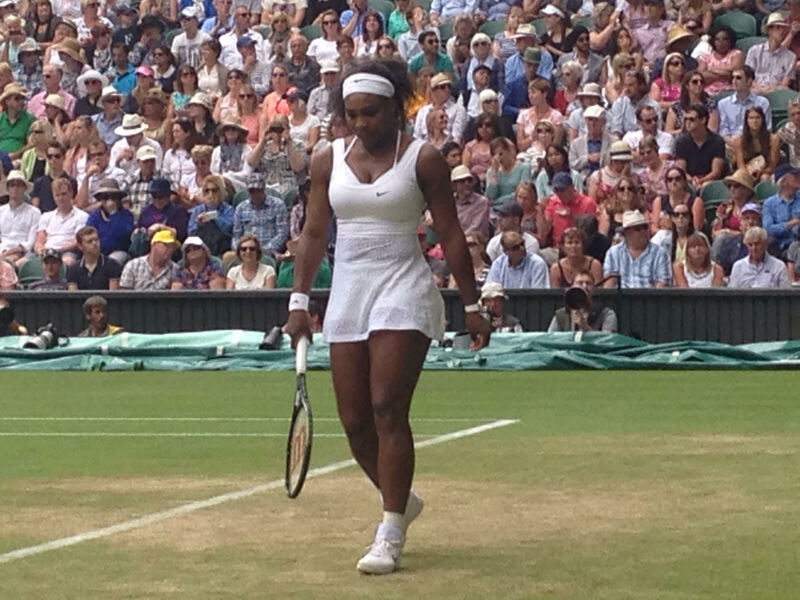 This entry was posted in Eventraveler Experiences, The Sporting Life and tagged Grandslam, London, Serena Williams, Sharapova, Tennis, The Championships, The Queue, Wimbledon.